Isabel Quintero’s first novel, Gabi, A Girl in Pieces, was one of School Library Journal and Kirkus Reviews Best Books of 2014, and won the American Library Association’s William C. Morris YA Debut Award prize. Her second book, Ugly Cat & Pablo, was published in April 2017. She lives in Southern California. Zeke Peña is an artist and illustrator whose work about the U.S./Mexico border community explores universal themes by remixing contemporary and historical narratives. He has exhibited at the National Museum of Mexican Art in Chicago, Albuquerque Hispanic Cultural Center, Houston Center of Photography, El Paso Museum of Art, and Museo de Arte Ciudad Juárez, as well as in galleries across the United States and Mexico. "Mixing original illustrations, first-person prose, and lyrical interludes with gorgeous reproductions of photographer Graciela Iturbide’s work, Quintero and Peña patiently reveal their subject’s many angles, producing a “kaleidoscopic unraveling” of the artists… Teens will come away with an evolved sense of how to look at a creator’s life and work and how to think critically about art as a process. The importance of being seen, specifically in regard to indigenous communities in Mexico and Mexican Americans in the United States, as a narrative thread will resonate strongly with readers. VERDICT Quintero and Peña have set a new standard in artist biographies. A must for teen collections." "Quintero and Peña’s biography of Mexican photographer Graciela Iturbide is far more than an account of her life . . . Eye-opening and masterfully rendered." "Quintero and Peña strike a good compromise, featuring many of Iturbide’s photographs as a complement to the biography, but without being dependent on them. The result is a book that expertly combines various aspects to become something utterly unique." “The graphic novel honors a provocative life by taking a provocative form." "From pieces such as Our Lady of the Iguanas, Juchitán, Oaxaca (1979) to Rosario and Boo Boo in Their Home, East L.A. (1986), we see Iturbide become one with her subjects, somehow transcending her role as photographer and entering into a relationship with everything her camera captures. The artwork of Penã, which depicts these interactions, seems to do the same, joining audiences to Iturbide’s experiences. . . . Recommended to anyone interested in fine art photography, particularly of Mexican and Southwestern American subjects, and for library collections with a focus on this area." "It is a rare feat when a writer and illustrator are able to capture the creative magnitude of an iconic photographer. 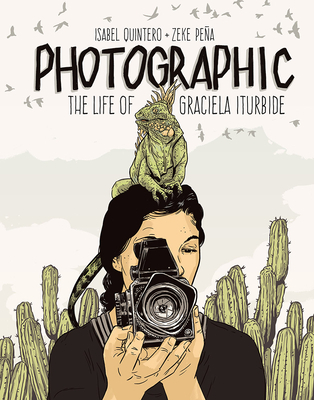 With poetic prose by Isabel Quintero and luminary illustrations by Zeke Peña, the stunning biography Photographic: The Life of Graciela Iturbide will guide readers through a compelling visionary journey. Photographic is a worthy homage to an important and influential photographer and will stand alone as a truly creative piece of work." "[Graciela] Iturbide’s artistic vision and story are conveyed with poetry, a simple sophistication, and a dollop of bold swagger"
"This extraordinary biography captures the poetry of Graciela Iturbide’s photography. The brilliant pairing of Isabel Quintero’s words and Zeke Peña’s art creates a graphic biography that evokes the process and meaning of what it is to create. Highly recom­mended!" “A fascinating book that blends the story of Iturbide’s life with poetic interpretations of pivotal moments in her career. . . . Even if you’re not already a fan of Iturbide, Quintero’s story of the photographer’s journey as an artist is incredibly inspiring. Like Frida Kahlo, Iturbide was born into a life of privilege, which came with the burden of overwhelming expectations. Her decision to reject that life in order to pursue her art is nothing short of courageous."